One morning, the world does not wake up. People lie dead in their beds, killed by their own nightmares. They’re lucky. For the few remaining survivors, the new world is a confusing, terrifying place. Things are different now. The balance of nature has shifted … Mankind is not longer the dominant species–it is an intruder, something to be removed, destroyed by an Earth bent on vengeance. Blane is a man on his own in this world gone mad. he has no distant memories, only the vague certainty that something momentous has happened in his past. Fay is enigmatic, dangerous, a dark witch and a player of gruesome games. What roles will they play in nature’s new era? And will they be able to survive long enough to find out? I’m not sure who reads this, but I’m excited to finally be able to say something. 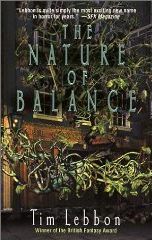 I’m currently 17, but I have had “The Nature of Balance” since I was probably 6 or so. I always used to try to read it when I was younger, and I recently found the book again and got to read through it. This book is nothing less than my favorite, and I’ve been trying to find a way to contact someone about making it into a moive. I’m extremely glad to see that it is in the process of being made into one too, I think it will make the perfect “horror” movie. =)Tim Lebbon has been my inspiration to write what I write all my life, even though I didn’t understand what the book was about when I was so young. Thank You! !